Our featured recipe of the week is a sweet southern treat. Did you know? Pralines first originated in France and were brought over by French settlers to New Orleans, Louisana. This praline recipe by our Chef of the Month Alekka is a delicious take on the American Southern praline. Add butter and pecans, bring back to a soft ball stage while stirring. Remove from heat, add vanilla and beat until mixture begins to thicken. Drop by teaspoons on sheet pans lined with silicone mats. Let set and cool before serving; store in air-tight container. A small amount of syrup dropped into cold water forms a soft, flexible ball, but flattens like a pancake after a few moments in your hand. Get in contact with Chef Alekka and visit her shop Give Me Some Sugar if you’re in the Chicago area so you can learn how to make these amazing treats! This recipe comes from our February Chef of the Month, Alekka Sweeney. Valentine’s Day is approaching and we all like to take this time to indulge in some dessert. This recipe caters to anyone with a sweet tooth and love for all things chocolate. Take a break from your New Year’s diet and enjoy the finer things in life… and one of those things is sugar! Preheat oven to 375°F. Line a 15- by 10- by 1-inch baking pan with foil, allowing 2 inches of foil to hang over ends of pan, and grease foil well (except overhang) with 1 tablespoon butter. Melt remaining 11 tablespoons butter with unsweetened chocolate in a large metal bowl set over a pan of barely simmering water, stirring until smooth. Remove bowl from heat and whisk in sugar, espresso powder, vanilla, and salt (mixture will be grainy), then add eggs 1 at a time, whisking after each addition until batter is smooth. Toss together flour and chocolate pistols in another bowl and add to batter, stirring until just combined. Spread batter evenly in baking pan and bake in middle of oven until top is firm and edges just begin to pull away from sides of pan, about 20 minutes –be careful not to overbake. Cool in pan on a rack 5 minutes, then carefully lift brownies from pan by holding both ends of foil and transfer to rack to cool 10 minutes more. Cut into 32 squares and lift brownies off foil with a spatula. Love this recipe? Get in contact with Chef Alekka and visit her shop Give Me Some Sugar if you’re in the Chicago area so you can learn to bake like a pro! demonstrations and classes around the U.S. and Canada. Chef Werner is a James Beard Foundation “Outstanding Baker” 2015 finalist, Dessert Professional’s “Top Ten Pastry Chefs of America 2015,” The Passion Company’s “2015 Most Passionate Chef/Restaurateur in San Francisco,” San Francisco Magazine’s “2014 Best Pastry Chef,” Plate Magazine’s “2014 30 Chefs to Watch,” Star Chefs’ “2013 Rising Star Artisan” and James Beard Foundation “Outstanding Pastry Chef” 2012-2014 semi-finalist. Congratulations Chef Werner on being our Chef of the Month for December! Craftsman and Wolves, a patisserie and cafe with two locations in San Francisco. 4. What advice would you offer for aspiring pastry chefs? Dig deep to the roots, don’t get caught up in the current trend, take time to understand the basics. 5. What is one tip every pastry chef should know and perfect? How to work with chocolate. I believe you eat with your eyes first, so an appetizing dish is key, usually minimal wins for me, all ingredients on the plate are harmonious and make sense, nothing is there just to be there. 10. What trends do you see emerging in the near future for Pastry Chefs? I see more health conscious desserts that don’t sacrifice flavor and texture — luxurious meets beneficial, if you will. Short sleeved chef coats are my favorite, only one breast pocket, and definitely fitted. I’m not a fan of pen holders on the sleeve. Vintage Metallica t shirt, jeans and full bib apron. 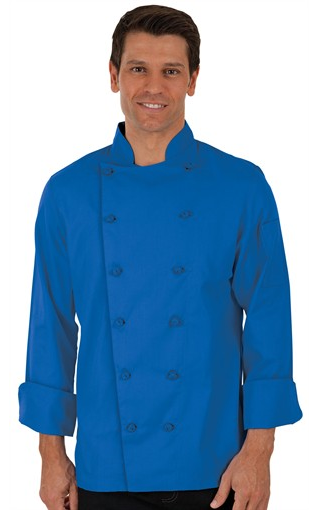 Chefuniforms.com, a leading retailer of restaurant and chef uniforms, sponsored Traditional Fit Chef coats for all contestants on Food Network’s ice cream-themed competition series, King of Cones.The series which premiered August 4th, 2014, can be seen Mondays at 8pm ET/PT on Food Network. ChefUniforms.com sponsored all of the traditional fit chef coats for each contestant on the series, outfitting each team in 4 colors: Ocean Blue, Ember Orange, Wine and Apple Green. The colors add a stylish flair and complement the ice cream theme of the competition. The Traditional Fit Chef coats have knotted cloth buttons and are made with a 65/35 Poly/Cotton blend which adds a richer fashion detail to each chef’s professional look. The coats provide a more contoured, tailored cut with extra room built into the biceps and underarm areas that both men and women can wear. King of Cones is an ice-cream competition challenging dessert chefs to make the most incredible frozen treats imaginable. In three heart-pounding elimination challenges, a giant ice cream truck arrives with a new theme and a mystery ingredient that the four talented contestants have to translate into a uniquely delicious ice cream dessert – before time runs out. In the end, only one will scoop up the grand prize of $10,000 and be named King of Cones.